Global warming will bring down the population of the emperor penguin in Antarctica by half by the end of the century, a recent study claims. The number would fall by at least 19 per cent from the current level as sea ice, on which the emperor penguins (Aptenodytes forsteri) breed, continues to melt. The study was published in the journal Nature Climate Change on June 29. Antarctica has a 600,000-strong emperor penguin colony. With the distinct golden patch on their heads, these penguins are the largest of the species, growing up to 1.2 metre tall. 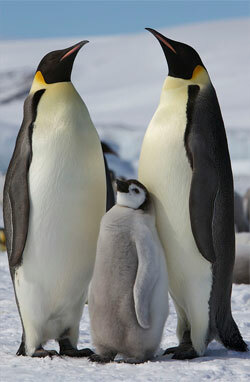 According to a media report, emperors are one of the three penguin species rated stable. While king, adelie and chinstrap penguins are increasing, the population of most of the 18 types is declining. Shifting sea ice makes it difficult for the emperors to breed. As the males huddle together to keep the eggs warm in winter darkness and freezing temperatures, the females waddle up to 100 km to catch fish. Too little ice means waves could break up colonies in spring, and too much ice means the females will have to travel farther, the report states. “There is a goldilocks point for ice and emperor penguins,” Phil Trathan, an expert at the British Antarctic Survey, is quoted as saying in media reports. He added that it was unclear if the birds could adapt by climbing onto land or higher ice. This is not a happy news for the emperor penguin, Hal Castellan of the US Woods Hole Oceanographic Institution and co-author of the study, told the media house. The researchers have called upon various governments to list the penguin as endangered. Such a listing, however, could impose restrictions on tourism and fishing companies. The study also discusses the problems of defining conservation criteria for species endangered by future climate change. Around more than 75% of ice is in East Antarctica. At present it is building. Antarctica and Arctic regions present opposite pattern -- cold and warm phases of a cyclic variation --. Thus, Penguins adopt to these warm and cold phases. So far global warming component is negligible since 1951 to date [< 0.25 oC]. Therefore, there is no such thing happen. In the case of Arctic several other human and natural impacts create artificial impact on ice -- formation of new island and destruction of old islands, etc --. With the population growth and new technological inventions that harm environment affect this drastically. We must control such factors instead of blaming global warming as global warming is used to mint money.